There is much serendipity in genealogy: more than once I have pulled a book off the shelf in the library at NEHGS, intrigued by the title or perhaps the binding, only to find within its covers the answer to a vexing research question or a story that sheds light on a forgotten family member. One such volume is H.U. 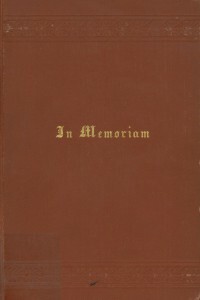 Memoirs, published in Boston in 1886, the earliest Harvard class book – not including the Sibley’s Harvard Graduates volumes – on the Society’s open shelves. 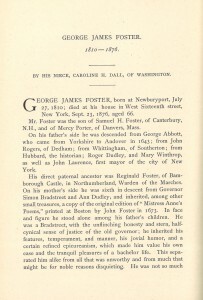 In it I found a charming short biography of my great-great-great-great-uncle George James Foster (1810–1876), written by his niece Caroline Healey Dall. But Nemesis stalked George’s father, who had survived the Newburyport Fire of 1811 (“and the horrors of the three days’ starvation which followed”) only for his business – relocated to Boston – to fail. George’s parents moved to New York to start anew, and George withdrew from Harvard Law School, shipping out as a super-cargo to China on a ship belonging to his brother-in-law, Mark Healey. He moved on to Rio de Janeiro, Lima, and then Valparaiso, where he became a partner in the mercantile firm of Alsop & Company in 1860. Not a believer in the supernatural, but sometimes those finds are just too spooky for rational explanation. Reading your post, the name Caroline Healy Dall caught my eye. 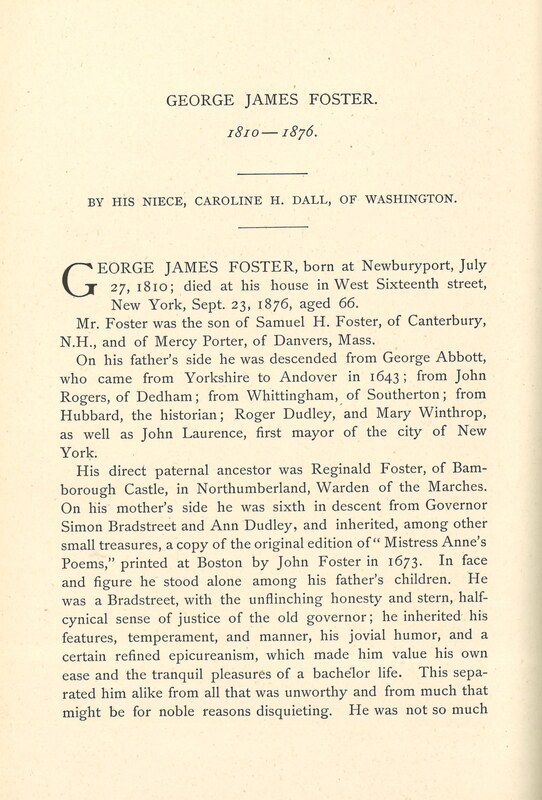 I have her edited journals (Daughter of Boston) and several Fosters are mentioned in there, though not George. Luanne, Caroline Foster Healey was the daughter of Samuel H. Foster and Elizabeth Symonds; her half-siblings (children of Mercy/Marcia Porter) included Samuel Henry Foster — my great-great-great-grandfather — Charles William Foster, and George James Foster. The Samuel H. Fosters (but not, I think, the Dalls) moved to New York around 1830. Caroline Healey Dall was the daughter of Mark Healey and Caroline Foster. I often hear wonderful tales of serendipitous finds, but it has never happened to me. Come on ancestors, help me out here! I am a strong believer in “other forces” at work in our world! Serendipity, help from the ancestors, pure luck and/or hard work paying off, is it amazing when this kind of thing happens! Thanks for pointing it out! I love this topic. My mother and I have definitely felt guided by the ancestors, and have done the same thing where we’re drawn to a book or article online or even a town, realizing later how crucial that hint would be in our research. We have had countless such experiences. I mean once my mom ordered a 900 page book and when she picked it up, she immediately turned to the very page- and the only page- which mentioned our ancestor and gave us incredible insight into his life. It happens over & over, and it’s pretty wonderful. And Jenny, it’s amazing how helpful ancestors can be when you ask them for help. Just ask them to show you where to go to find the answers. I’m a Find-a-Grave volunteer photographer too, and it’s helpful with that too. How was this serendipity rather than simply part of a thorough search? Oh, the research INTENT is there from the first. Scott already knew about the Harvard connections and finally got around to looking at that volume. 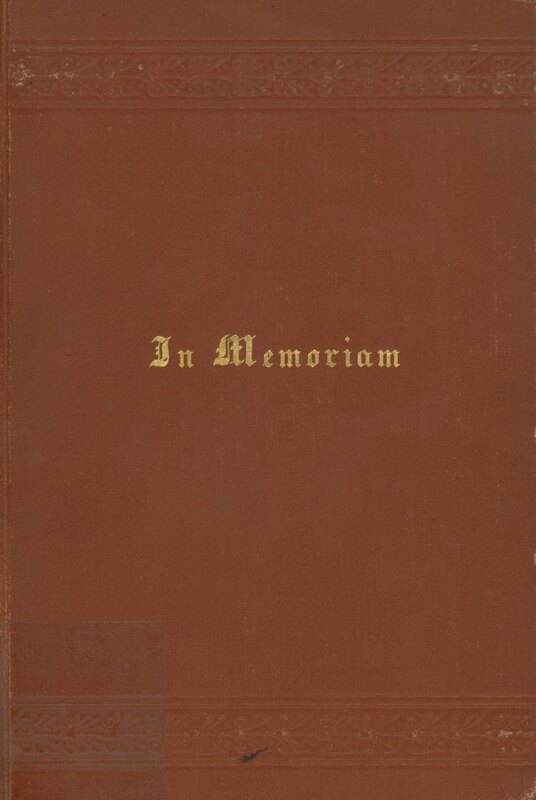 BUT, that GF’s niece wrote the memoriam, rather than an out-of-touch classmate or the volume’s editor, likely the case for a number of the pieces, gives it the personal slant that all of us hope for, well, that close to true serendipity. Certainly, I was going to check all of my second wife’s ancestral surnames on the 6th floor, and I did. But the authoress of The Badgleys didn’t have to extend her research to Badgley’s marrying out, but she did, and and my wife’s father, a Clark, didn’t have to respond when contacted in the early 1950s, but he did. So as I told her, you’ve been sitting on the NEHGS’s shelves since 1955. Then there was a friend who didn’t know about his mother’s first marriage at 16 in West Virginia, but that book had been on the society’s shelves since at least 1944. True serendipity would be to wander into Goodspeed’s, look at a shelf on genealogy, say to your self now that’s a nice binding, idly take the book down, and flip the pages leisurely until you hit the Aha! moment. Robert, your last paragraph captures my experience: I certainly wasn’t looking for Uncle George, or thinking (if I even knew) that he had gone to Harvard. I simply admired the binding, plucked it off the shelf, and started reading. Cousin Caroline’s memoir made it even more valuable to me. Another, even more serendipitous experience: I pulled Charles P. Keith’s Provincial Councillors off the shelf and flipped through the index. I remember thinking “I wonder if I might find my Ilsleys and Fowlers here” — they were on my mind at the time. Now, I had no reason to think that I would — I had no reason to think that they had any connection to Pennsylvania or to Provincial Councillors. But there they were: the line came down to the marriage of my great-great-grandparents, although the author didn’t know the groom’s name. It filled in many holes in my information on the Finlay, Fowler, Lawrence, Lawrance, Francis, and Turbutt families, and opened my eyes to their vast cousinage in the Mid-Atlantic states. And all because the Ilsleys were on my mind when I opened a book I chose at random from the shelf. I have had so many serendipity experiences: I had written a letter to a little town in Kansas and the postmaster could have just returned my letter to the library that had been shut down. She could have just trashed or “nixeyed” it but she opened it and she was the owner of the house that my 3rd great grandfather Simon Carpenter lived in. She had restored it an had found all the newspapers he had kept up in the attic. My sister in law had been kidnapped and taken out of state by her father and her mother never knew what happened to her. I found out that her mother had belonged to a church so I contacted the church. The secretary gave me the info she had on file which wasnt much. We went thru the file page by page she said it was all she had. When she reached up to put it away all these little slips of paper fell out at her feet. They were addresses of the 2nd husband of my sister in laws mom’s. She never saw them as we went page by page. She called me back to tell me the address of the 2nd husband but the mother of my sister in law had previously died. We found a step sister had been born to the couple mentioned and the step father was still living and in a nursing home.